Puma, a German company specializing in the manufacture of sports apparel, equipment and footwear. It was founded by Rudolf Dassler in 1924 and later registered in 1948. Puma is known as a manufacturer of shoes and football in its history has sponsored many famous footballers (Pelé, Eusébio, Johan Cruijff, Enzo Francescoli, Diego Maradona, Lothar Matthäus, Kenny Dalglish, Didier Deschamps or Gianluigi Buffon). Some also sponsors national football teams. Puma, whose origins lies, as in the case of Adidas in Germany, is currently one of the most widespread and most profitable businesses as production of sports shoes and other equipment for the sport concerned. 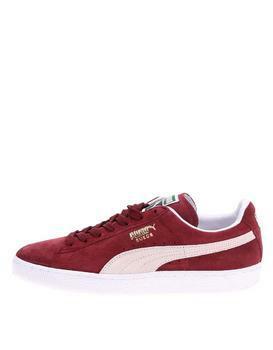 For some, this brand has become synonymous with shoes, Puma, it offers much more - in a collection of clothes you will also find shoes handbags, bags, T-shirts or sweatshirts should be. The history of the company Puma is to some extent linked with the history of Adidas, as the founders of both companies were brothers. The mother's spinning mill when Rudolf and Adolf Dassler started before the First World War to produce its first pair of shoes. After the war, then, Adolf founded Adidas and Rudolf your business names Ruda, which was soon changed to Puma Schuhfabrik Rudolf Dassler. Since he still lived in the same city, and its population was divided into two camps, with even some bars and shops were generally understood as a service for fans of this or that brand.